Wing span: 1 3/8 - 2 1/2 inches (3.5 - 6.3 cm). Identification: Extremely variable geographically. 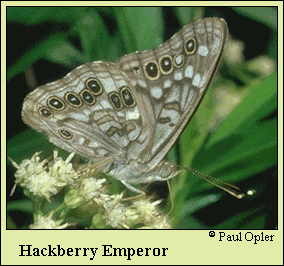 Upperside is reddish brown. Forewing has 1 submarginal eyespot, a jagged row of white spots, and the cell has 1 solid black bar and 2 separate black spots. Caterpillar hosts: Various hackberries (Celtis species) and sugarberry (Celtis laevigata). Adult food: Sap, rotting fruit, dung, carrion. Will take moisture at wet spots along roads and streams. Habitat: Along wooded streams, forest glades and river edges, wooded roadsides, towns. Range: Resident in most of the eastern United States, central Plains states, and the southwest mountains; northern Mexico.